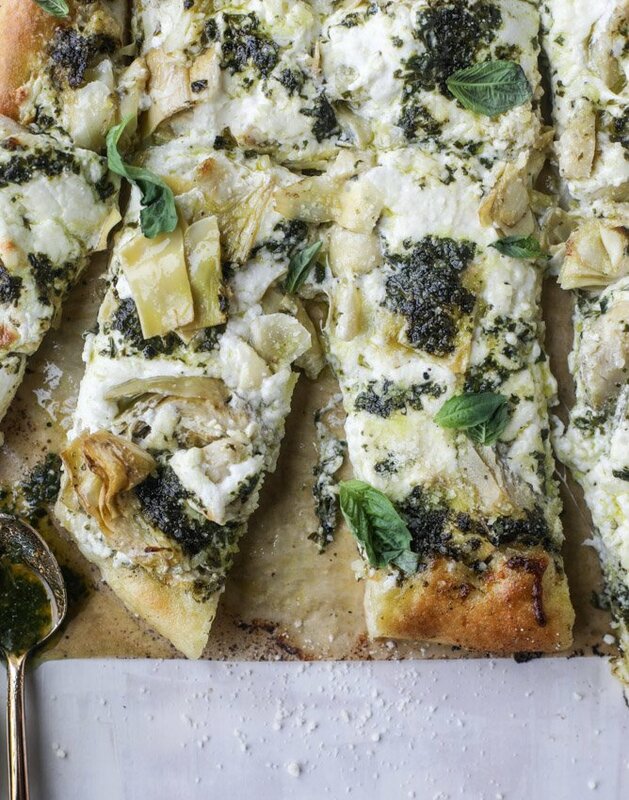 Artichoke Burrata Pizza with Lemon Basil Pesto. I feel like it’s been FOREVER since I made you a pizza! This is where I find us. In the middle of a chewy dough, melty burrata, grilled artichokes and lemony basil pesto. And I like it! Gosh. Okay, I know. It hasn’t been FOR.EV.ER but it has been a little over one month. Which is basically forever in pizza time. I spent most of the first three months of this year begging that my grocery stores had good basil. I was in need of a ton of it every week as we shot the cookbook – for recipes, of course – but also for garnish (those baby leaves work like nothing else!) and I can’t even tell you how much we went through. At one point, I think I bought all of the basil to be found in western PA, only to have it wilt in less than 48 hours. We also bought basil plant after basil plant, babying them to keep them alive even though nothing was working in the bitter cold. All of those rambles to say: now that I’ve finally got some GOOD basil and have blown through my freezer portion of pesto from last fall, a fresh batch was in order. One with lots of lemon and parmesan too. The best! Let’s just get this out there: I freaking love burrata on pizza. I know that some people are iffy on the topic, but I find that if you gently pat the burrata dry with paper towels and pull it apart all over the pizza, it melts like a charm. Of course, my first option for the burrata would be crustry bread, tons of olive oil, lots of herbs and fresh tomatoes, but the latter is nowhere to be found and I’m not using an orange rock from the grocery store. So, for at least a few more weeks, burrata on pizza it is! The grilled artichokes are perfection, because they add the briney bite that I LOVE. And I added a bit of provolone to enhance the meltiness, a sprinkle of parmesan because more cheese is never a bad thing and a sprinkle of fresh basil to make it look more veggie friendly. Of course. Essentially, this is a really easy pizza! If you have a jar of artichoke hearts, some pesto (whether it is already made, store-bought or whatever – you’ve got it!) and cheese, you’re all set. My favorite sight to see! That golden, crunchy crust that’s still chewy in the center and that bubbly, melty goodness. One last thing: a frosty chilled glass wine is the perfect companion here. Meanwhile, make your pesto! Combine the basil, lemon zest, juice, cheese, pine nuts and garlic in a food processor. Pulse until small crumbs remain, and then with the processor running, stream in the olive oil. Start with the 1/2 cup and add the extra if needed to reach the desired consistency. Add the salt, pepper and pepper flakes and blend again. Taste and season additionally if needed. Spread a few tablespoons of the pesto all over the dough. Top with the grated provolone. Tear apart the balls of burrata and place them all over the dough. Add the artichokes. Bake for 20 to 25 minutes (or around 15 to 20 minutes if using the pizza stone) until the cheese is golden and bubbly. Remove and top with the extra basil and parmesan if you wish. Slice and serve immediately. Isn’t that a huge bite of Spring?! Okay, YES! This is definitely the perfect pizza to make a comeback with. Also, omg the basil thing made me laugh so much because it’s like the story of my life. Do you put your baking sheet in ahead of time? Oh this sounds so yummy. You’ve officially inspired me to try burrata on my next pizza! We have the same issue with basil here in IL. It seems they never have any or there never seems to be enough to choose from! Tried growing our own at one point – turns out, I do not have a green thumb. Pizza looks amazing! This pizza looks ridiculously amazing! I’ll have to give it a try as soon as possible! once had a pizza with a ball of unmelted burrata just plopped on top. that was interesting. this sounds a lot more practical for eating! and lolol orange rocks (it’s more ridiculous if you think about literal neon orange craggly rocks). thank you for the burrata melting tip, love burrata and think it’s under-utilized vs mozzarella, never tried it on a pizza, but this is a great place to start! Hmm this looks delish! Definitely something to try out soon! This looks absolutely delicious! I’ll be trying this recipe at home! Thanks for the wonderful recipe! Must. Eat. Burrata. This looks absolutely divine. I mean seriously, the perfect balance of flavor and richness! Omg this looks insane!!! Will definitely be making this ASAP! I made this a few nights ago, and it was SO GOOD! I totally cheated and used whole food’s pizza dough, but it still came out great. I’ve got everything to prep pistachio pesto but one question: how do you freeze it? Just as is in ice cube trays? A little extra oil on top? (I think that’s an Ina trick) While I only have a mini chopper, I’m still hoping to make a big batch and freeze some for other spring recipes in the next few weeks. For fresh herbs in the winter, I’d recommend the AeroGarden. I thought they were ridiculous at first, but wound up with a 3-pod one regifted to me from a family member who never used it. I didn’t have anything to lose so I gave it a shot. Um, it’s kind of amazing. With your line of work, you’d find it even more useful than I did as the average home cook. PLUS, your son will love to watch things grow and it’s a great nightlight for your kitchen. Our little boy raced down every morning to check on his seeds and see if they grew overnight.